Six RTD bus lines stop in Belmar, taking riders to downtown Denver, Cherry Creek, Southwest Plaza, and many other Metro Denver destinations. We have easy access to the Wadsworth light rail station and bus routes to other stations as well. RTD Call-n-Ride service provides door-to-door service to nearby neighborhoods and businesses. How can I find out which bus to take and where to catch it? Trip-Planner at rtd-denver.com gives you options for which bus to take, location of the bus stop, and how long the ride will take. Just type in your starting point, destination, and when you want to travel. Look for the red RTD signs on Virginia Avenue, Saulsbury, and Vance. The signs tell which buses stop there. 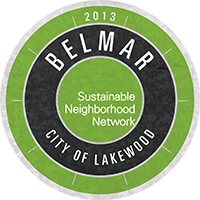 Paper schedules with route maps for all buses that stop in Belmar are available at the Belmar office, 464 S. Teller. One-way fares for most bus and light rail routes are $2.25. People 65+, K-12 students, and people with disabilities pay discounted fares of $1.10. You must pay cash or have a prepaid ticket. King Soopers in Lakewood Commons sells book of RTD tickets for $20 or $10 for discounted fares. Transfers are free, usable for bus routes and light rail. How does RTD Call-n-Ride work? Belmar residents (east of Wadsworth) are eligible for the service. Call-n-Ride will take customers to addresses west of Wadsworth, east of Kipling, north of Morrison Road, and south of W. 13th Ave. The shuttle turns around at the Safeway at Garrison and Colfax. Make a reservation by calling 303-519-0373 two hours to two weeks ahead of time. You will be picked up and returned at your curb or at a nearby bus stop. Regular RTD fares apply. Service is available from 5:30 AM to 8:00 PM. How can I get to and from the Wadsworth Light Rail Station? The free Belmar shuttle runs from 464 S. Teller to the Wadsworth Light Rail Station. It leaves Belmar on the hour from 11 AM to 7 PM and leaves the Wadsworth Station on the half-hour 11:30 AM to 7:30 PM. If your travel takes place outside of the free shuttle hours, you can take the #26 or the #76 bus from the stop in front of Target on Vance Street. Do you know you can get to DIA by light rail and bus? Take the light rail from Wadsworth Station to Union Station. Walk to the new Concourse open on May 11, 2014, pick up the Sky Ride bus AF and ride all the way to the airport. Cost from Union Station is $11.